LABOUR’s “core vote” is no longer big enough to win elections in Scotland, leadership frontrunner Kezia Dugdale has said. 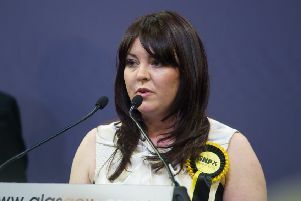 The Lothians MSP spoke out as she secured the backing of most grass-roots party groups in her bid to replace Jim Murphy. Thirty (88 per cent) Scottish constituency Labour parties (CLPs) - as well as four unions - are backing Ms Dugdale. Ms Dugdale said today: “I am proud to have earned the support of 88 per cent of local Labour Party groups that have made supporting nominations, a number of trade unions and our student and youth wings. “I have been able to reach out to the different sections of the Labour Party and now we must do the same with the country. “Our core vote isn’t big enough to win elections any more, if it ever was. “If the history of our Party tells us anything it’s that we win elections by reaching out beyond our natural supporters. Ms Dugdale faces competition from Eastwood MSP Ken Macintosh to replace Mr Murphy who quit in the aftermath of Labour’s election meltdown in May which saw the party win just one seat in Scotland. And Ms Dugdale - who also has the backing of most MSPs - said Labour must now adopt a border appeal. “Too often in the recent past it has looked like we are only on the side of one group of people – the most vulnerable in society, she added. “Labour will always stand up for the weak and voiceless, but we also need to represent the vast majority who aren’t struggling but just want to do better for themselves.